Having kids is expensive enough without having to spend $50 at Chuck E. Cheese every time you and your kids need to get out of the house for a couple of hours. Instead of wasting all of your money doing things that don't even last long enough to cure the boredom, check out one of these free Louisville kids activities. Kids Workshops at the Home Depot are designed for kids aged 5 to 12 and are offered on the first Saturday of each month from 9 a.m. to Noon. In these workshops, kids will create one of a variety of projects, such as toolboxes, fire trucks, and birdhouses. The Ogle Center at Indiana University Southeast in New Albany, Indiana, hosts a number of free shows for children throughout the year. Every year brings new shows which are appropriate for children of all ages. Henry's Ark Petting Zoo is an exotic animal petting zoo in Prospect, Kentucky. The petting zoo features animals such as water buffalos, capibaras, emu, llamas, zebras, yaks, camels, ostriches, and an albino peacock, among others. Admission to Henry's Ark Petting Zoo is free, but donations are gladly accepted. Henry's Ark Petting Zoo is 12 miles east of Downtown Louisville off of U.S. 42 on Rose Island Rd. They do not currently have a website, but can be reached by phone at (502) 228-0746. There are tons of free events for children of all ages going on every day at Louisville Free Public Library locations all over the city. You can view upcoming events by clicking the link above. You can always read to your kids at home, but if you just need to get out of the house and let someone else do the reading for a change, you may want to check out Story Time Tuesdays at the Pottery Barn in Oxmoor Mall. Kids receive a free gift after attending five story sessions. If your kids are a little older and like biking, skating, or skateboarding, you may want to take them to the Louisville Extreme Park. The Louisville Extreme Park is a 40,000 sq. ft. concrete skate park where people of all skill levels can skate and bike 24 hours a day, 7 days a week. Yew Dell Gardens is a huge expanse of beautiful plants, many of which are rare. Kids will enjoy the plants as well as some of the garden's other decorations, including a stone castle. You'll have to pay to get yourself in, but kids aged 12 and under get into the gardens for free. The 21C Museum Hotel Art Gallery isn't a typical art gallery. Digital installations that require audience participation will entertain kids, as will the bathrooms with films of eyes watching or with walls that appear to be see-through. The 9000 sq. ft. art museum is open to the public 24 hours a day, 7 days a week. School-aged children might enjoy watching a play at Actors Theatre put on by the Apprentice Company. You should be able to decide if a play is age-appropriate by reading its description on the Actors Theatre website or by calling the customer service number to ask someone who is familiar with the content of the play. Free plays are shown at different times from mid-August to early May. Louisville's Parks feature a number of things that kids will enjoy. 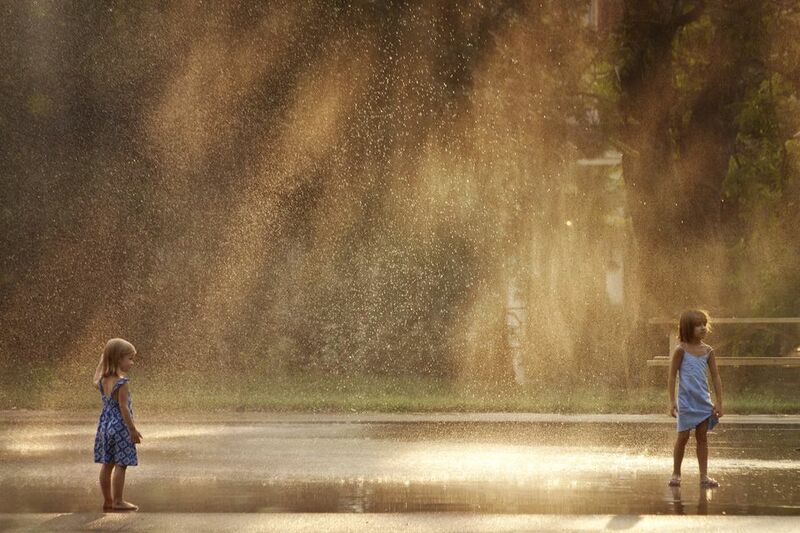 Some have spray parks that are a great way to stay cool and have fun in the summer. Most have hiking trails. All have playground equipment. Louisville has an amazing parks system that you and your kids will both enjoy exploring. While there is a fee to get into the Falls of the Ohio Interpretive Center, wandering around the park itself is completely free (aside from a $2 parking charge). Take your kids when the water is high, and they will be mesmerized by the rushing, falling Ohio River. The Louisville Nature Center is a place where people can explore, learn about, and enjoy nature. The Louisville Nature Center features butterfly and dragonfly gardens, wildlife exhibits, and hiking through Beargrass Creek State Nature Preserve. Admission to the Louisville Nature Center is free as are a number of special events hosted by the center throughout the year. The Museum at the American Printing House for the Blind houses items that help visitors explore the history of education for the blind in America. Both admission to the museum and guided tours of the factory are free. Additionally, the museum occasionally hosts free events for children and families. Cave Hill Cemetery is a Victorian-era cemetery and arboretum that is open to the public. Cave Hill is a pleasant and photogenic place where people go for the lovely scenery and intricate gravestones as well as to visit their deceased loved ones. The land is home to a cave, lakes, and the graves of many famous Louisvillians, including KFC founder Colonel Sanders. The Carnegie Center for Art and History is an art gallery and history museum located in New Albany, Indiana. The center has two permanent exhibits. ​One of these, Ordinary People Extraordinary Courage: Men and Women of the Underground Railroad, is a multimedia exhibit that tells the story of two groups of people living in antebellum Kentuckiana. The center also has several revolving exhibits and occasionally hosts free workshops and classes for families.